Things change as you grow. Even though you still provide the same service/product, you need to change how you do it. Running a business with 40 employees is not the same as running it with 10. There are some common stages every company goes through as it grows. 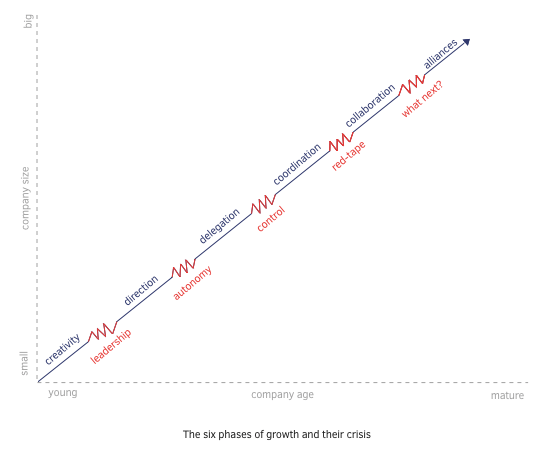 The most well-known growth models are Greiner's Growth Model and Adizes’ Corporate Lifecycle. They both illustrate common stages and problems each stage brings as your company grows. These models can help you assess where you are, where you will be in a few years, and what traps you'll have to avoid in order to get there. You need to update your processes as you grow because everything breaks roughly at multiples of 3 and powers of 10. For example, when you're running everything single-handedly, everything works. But then there are 3 of you and things are different. You suddenly have to collaborate, make decisions together, divvy up work, etc. Then you adjust and you're fine for a while. But when you get to 10 people and everything breaks again (things like how you handle payroll, schedule meetings, communicate, make decisions, allocate resources, hire, onboard new employees, etc.). This cycle repeats at points of 30-100-300-1,000 people. This is why companies which grow quickly get in trouble. A fast-growing company can go from 30 to 400 without updating their processes. That's why companies constantly need to innovate and improve. Be careful though, innovation for its own sake isn't good either. This is a trap big companies fall into often. Big companies figure out how to run a 1,000-people company but getting to 3,000, ie. the next breakpoint, takes a lot more time. But big companies feel like they have to innovate all the time and so they come up with reengineering initiatives they don't really need, thus wasting time and resources. Larry Greiner said each company goes through 6 stages. In each stage, a company grows differently (eg. the company's early growth is driven by founders working hard while later growth is driven by delegating work to managers) and different crises (eg. when you delegate, you start to lose control). 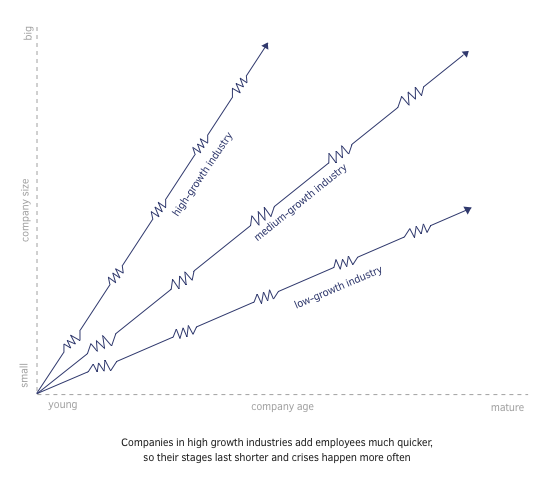 A company’s stage (along with problems and solutions) depends on the number of its employees, company age, and growth rate typical for its industry (for instance, a company in a rapidly expanding market like software has to add employees quickly, so it goes from one stage to another much quicker). Each stage consists of 4-8 years of stable, continuous growth followed by a crisis. If the company survives the crisis, it goes to the next stage. And to go to the next stage, the company needs to change how it’s organized. More people means your coordination and communication problems magnify, the management hierarchy multiplies, and jobs become more interrelated. Management practices that were appropriate for a smaller size no longer work. Companies that are unable to change their practices are likely to either fold or stop growing. So it becomes critical to find a new set of processes for the next stage in the company's evolution. Ironically, a solution for one stage becomes the core problem in the next one. Also, a company can't go back to a previous stage but must cope up with a new solution. Early growth depends entirely on the founder's energy. Founders are involved in everything. They disdain management activities and prefer an informal culture. Work is hard, pay is poor, and sleep is a luxury. What keeps people going is the promise of ownership benefits. There are only a few employees so everyone does everything. There is no specialization and communication is frequent and informal. This is also the stage where the company reacts to its customer feedback the most. As work expands and the company hires more people, the founder doesn't have time to be involved in everything. They need to let go off technical work. The creative energy and flexibility that got the company off the ground become the problem. As the number of employees rises, informal communication starts to fail. At one point, you will need a more robust project management tool to keep all communication in one place. Employees enthusiasm isn't as intense as it used to be and founders need to find another way to keep employees engaged. The problem is, founders don't like management responsibilities and start missing the “good old days” when things were simpler. To get to the next level, the company has to solve the leadership crisis and abandon a flat hierarchy. The founders need to step aside and hire their first middle managers who can pull the organization together. Employees are organized by functional departments, like marketing, sales, or production. Jobs become increasingly specialized and first processes are introduced and become standardized. Communication becomes more formal due to the new hierarchy and job titles. Managers direct where the company will go and assume most of the responsibility for their decisions. Lower-level supervisors are treated more as functional specialists than as autonomous decision-makers. Because managers direct how others work, lower-level employees become restricted by a centralized hierarchy. Employees have direct knowledge about work but in order to do something, they first have to run the decision through their manager. So they end up torn between following procedures and taking initiative on their own. The solution is to empower employees and delegate responsibilities. But there are two problems: a) it's difficult for top-level managers to give up responsibility, b) lower-level managers are not used to making decisions by themselves. Now there is a formal management structure, which consists of several layers, mainly top-level management and middle-level functional management. The company has a decentralized organizational structure so each function can make its own decision, based on direct experience. To motivate employees, bonuses are used. Because middle managers have greater authority and incentives, they can penetrate larger markets and respond faster to customers. This all leads to greater growth. Middle-level management is responsible for results while top management acts when something unexpected happens, which they learn through periodic reports from the field. Communication from the top is infrequent, formal, and occurs through visits, correspondence, or telephone. A crisis occurs when top-level executives start to feel they are losing control. Tension grows between top-level and mid-level managers who are used to running thing on their own. Unit managers don't want to share their resources with the rest of the organization because they aren't rewarded for coordination. Top management might attempt to return to centralized management, but that fails because the scope of operation is too big. The solution is to find special coordination techniques that will align every business unit with a common goal. By this point, the company is a corporation. Top-level managers introduce formal systems for coordination and take responsibility for their administration. Once decentralized units are now are merged into product groups. All planning is formalized and intensively reviewed. The company hires more and more people to work at its headquarters who will work on company-wide programs that will control line managers and review their work. Each unit receives a budget according to a plan from headquarters. This system encourages field managers to look beyond their unit's needs in favor of the company as a whole. While some functions become centralized (like data processing), daily operating decisions remain decentralized. Still, field managers remain subservient to headquarters to whom they have to justify every action. 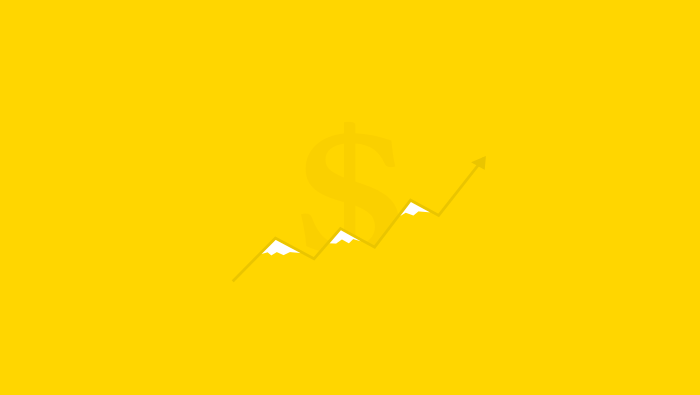 Stock options and companywide profit sharing are used as work incentives. Due to all the bureaucracy, confidence starts to erode between headquarters and the field as the systems stop being useful. Headquarters lose touch with the local conditions and line managers grow resentful as they don't have the authority to change things due to red-tape and directives from above. In a nutshell, the company loses its ability to innovate and conquer new markets because it becomes too focused on efficiency. The top management simplifies control mechanisms and introduces autonomous cross-functional task teams whose job is to solve problems. The management becomes more flexible and emphasizes spontaneity though quick team decisions. There are fewer people at headquarters as most get reassigned or combined into interdisciplinary teams. Those teams work together with field managers and come to decisions together, as opposed to headquarters telling line managers how to work like in the previous stage. People are no longer incentivized for their personal achievement but by their team's performance. Kaizen, or continuous improvement, become the company's main philosophy as teams are encouraged to innovate. Stage 5 Crisis: What Next? At this point, the main problem becomes further growth as the business runs out of ideas. The only way a company can grow further is through strategic alliances and acquisitions, which mark the beginning of stage 6. After that, there are no more stages. Greiner’s Growth Model outlines how management needs to change as the company grows. While most companies will never reach later stages, it's still useful to see where your company is and get an idea what lies ahead for your company 5 or 10 years from now, from a management perspective. There is also Adizes’ growth model that focuses more on the entrepreneurial side of things.